Where’d this tweepy package come from, anyway? Here’s a program that uses the Python tweepy package to search Twitter for tweets. Clicking “Keys and Access Tokens”. See the screenshot below. # You can ignore the next two lines. They're just to get the screenshot to show up in the notebook. Now add the file with this code to your repository, and push it to GitHub. I didn’t actually publish this code to GitHub, but the screenshot below shows one way to discover the API keys of users who did. People will start using your API key, and this will cut into your API limits → your application stops working. You can’t (easily) share your code with someone who uses a different API key. They have to edit your code; when you publish a new version, they have to remember to edit it again. An attacker can use your API code to spam Twitter, and then one or more of: you get blamed for it; your application key is revoked (→ your application stops working); your application is revoked (→ your application stops working, and it’s harder to fix it); your account is suspended (and it’s even harder to fix it). The simplest solution is to move your secrets into another file (say, config.py), that isn’t checked into git. 3. Modify your Python code to import consumer_key and consumer_secret, instead of defining them. from config import consumer_key, consumer_secret # This line replaces the lines that set the variables. 6. If you already published the API key to GitHub (or another public location), re-generate the API keys. 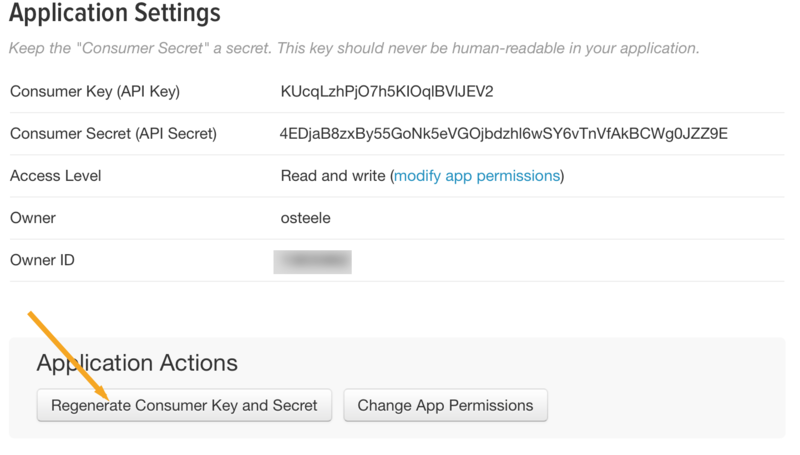 For example, by publishing this notebook, I published my (previous) Twitter API keys. Now they’re different. Setting the environment variables is a bother to remember each time your create a new terminal window, so it’s common to place those lines in your .bashrc instead. There are also packages such as http://direnv.net, that let you place environment variables in a file in your project directory. This is useful if you’re working on several projects, and want to keep track of which environment variables go with which project. Placing secrets and other configuration information in environment variables is especially prevalant in server software development, where different API keys are used (1) for development, (2) a staging environment, and (3) the production environment. See The Twelve-Factor App: Config for more on this. Another technique is to place secrets in a configuration file that is checked into the repository, but is encrypted. git-secret and blackbox are libraries that do this; transparent git encryption describes how to do this using git itself. Unfortunately, Pattern uses its own Twitter API key if you don’t supply one. This muddies the waters, so I looked for a package that required an API key. Google also lead to https://dev.twitter.com/overview/api/twitter-libraries. Often a service provider such as Twitter has an official or recommended library. Twitter doesn’t, but I decided to use its list of known libraries as a starting point. I planned to work my way through the most highly-ranked libraries – tweepy, twitter, and python-twitter – but stopped at tweepy, because it had good documentation, and it worked.